Are you looking for a funny and caring gift for someone who loves cats? Or maybe you just need something to lighten the mood at the office. Regardless of your reasons, this cat pencil sharpener shaped like a cat is a fantastic idea! Even more, if you work with kids (you are a kindergarten teacher) or you have kids of your own, this sharpener is the best way to motivate them to sharpen their pencils. While it’s quite small (warning for people with toddlers and babies who might swallow it) the sharpener is so much fun that everyone will love it (even dog people). What makes this so special? This is a question you might ask yourself when you find out you have to pay over $10 for it. It’s not much if you think about it, but it is a bit expensive for a sharpener. Well, this is not just another dumb, lifeless office prop as you might imagine! 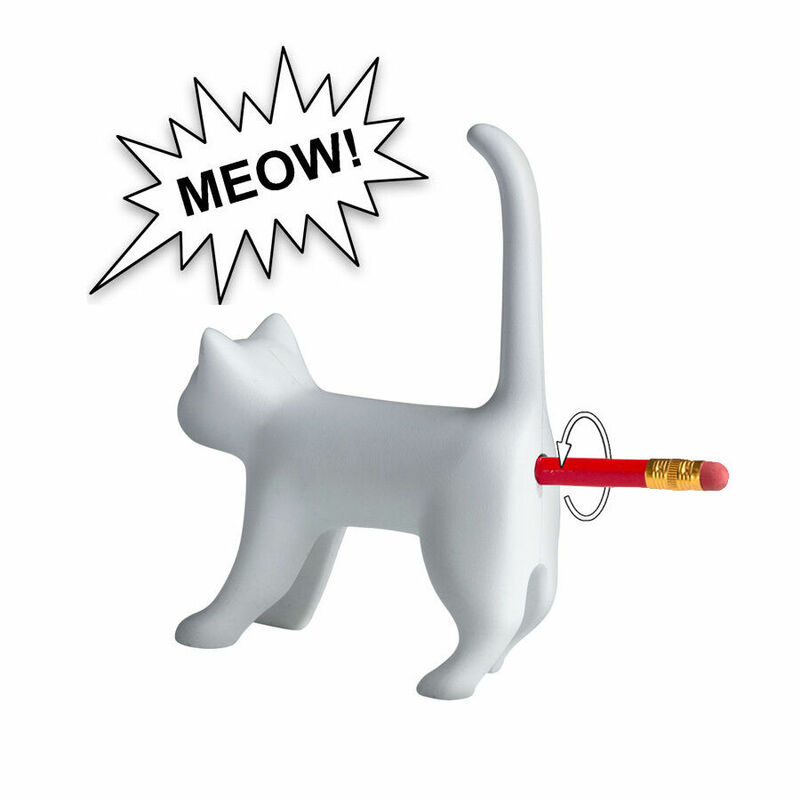 It’s an interactive sharpener that actually meows when you start sharpening your pencil and this will definitely lighten the mood in the room. Just try to imagine the surprise on everyone’s face when you use it for the first time! The Cat Pencil Sharpener is produced by Slam Design and comes in black or white (so you can choose according to preferences). The cat is standing with its tail lifted up and the pencil goes right under the tail (another funny aspect you can’t deny). To complete the picture, the cat pencil sharpener is delivered with a little litter tray (the same color as the cat) that will pick up pencil shavings when you’re done sharpening. Pretty cool right? Just place the cat in its litter anywhere on your desk and make sure you sharpen pencils just when the office is crowded with confused people – you’ll definitely have a good laugh! The pencil sharpener is equipped with batteries so the cat can meow every time you start sharpening. Still, you have to make sure you press the pencil hard against the sharpener to trigger the sound. However, one pretty big issue is the fact that you can’t actually change or charge the batteries when they die. Since the cat’s body is cast plastic, you don’t have access to its insides so, if you use it too much, there will come a time when kitty won’t meow anymore. It’s still pretty funny if you think about it, but it won’t have the same effect on people. Well, if you like making people around laugh or you love giving the craziest, most inappropriate gifts this cat pencil sharpener is definitely for you! While it’s true that you can’t expect extra high-quality results from it, it is a mood enhancer and it will put a smile on everyone’s face. In our opinion, this is a mandatory item for every office or home with kids who love using crayons. Still, it won’t last long in the hands of a kid so if you want to have it for longer, you should be careful.